July 29, 2009, Boeing today announced that it plans to bid as prime contractor for the Exploration Ground Launch Services (EGLS) program to provide ground systems integration and launch operations for Constellation, NASA's next-generation space-exploration initiative. EGLS will cover ground processing, assembly, testing, integration, launch and recovery services for Constellation's Ares launch vehicles and Orion spacecraft. 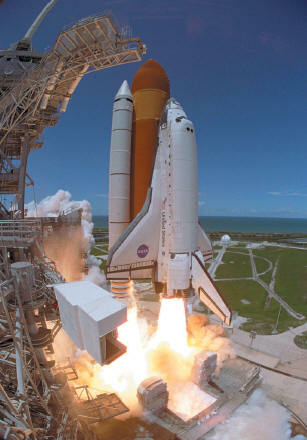 Current Boeing support for NASA includes serving as prime contractor on the Checkout, Assembly and Payload Processing Services and International Space Station programs and as major subcontractor on the Space Shuttle Program. The company has received contracts from NASA to provide the upper stage of the Ares I crew launch vehicle and the vehicle's instrument unit avionics. Final proposals for EGLS are due Oct. 26 and NASA is expected to award the contract in April 2010. Exploration Ground Launch Services (EGLS) supports the NASA Constellation Program at the Kennedy Space Center (KSC), providing ground processing, assembly, test and integration, launch, and recovery services for the Ares launch vehicle and the Orion spacecraft. NASA is expected to issue the EGLS request for proposals in July 2009, with the contractor award for EGLS anticipated in April of 2010. The EGLS Scope also anticipates options for continued support for the ISS Program, the transition and retirement of the Space Shuttle Program, and spacecraft fueling for the Launch Services Program.